We have had a black and white waddling invasion. 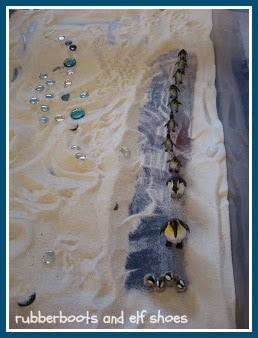 Penguins have taken over the sand/water table. And by the reception they got, it looks like they will be staying a while! 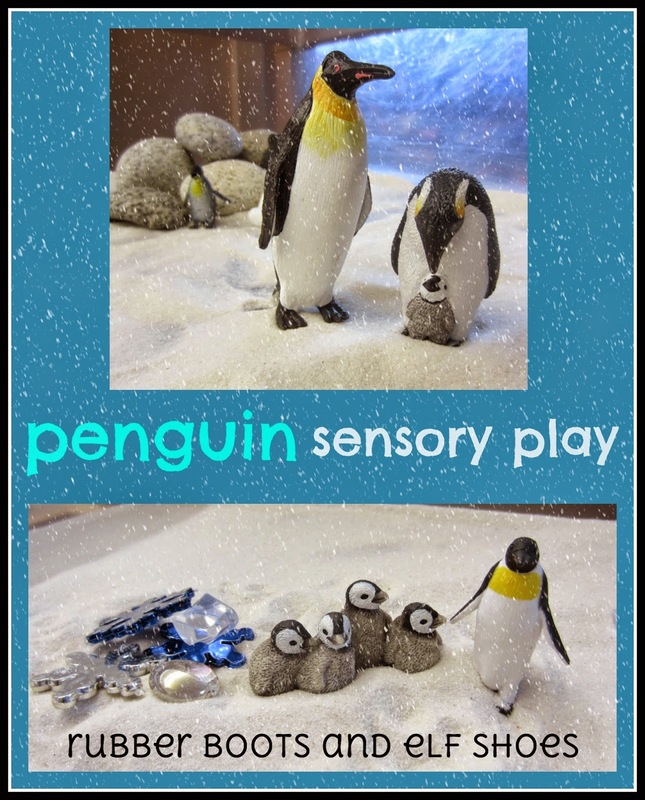 The sand/water table turned into a penguin habitat -- sand, penguin figurines, rocks, some glass gems and cut up snowflake garden make for lots of sensory, dramatic and creative play. 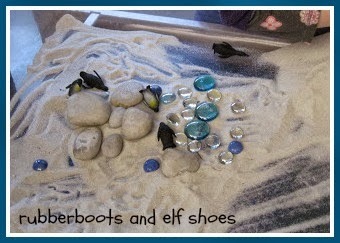 It's always fun to see what stories the kids create. Mama penguin taking care of the chicks while Dad goes to get something to eat. The penguins climb to the top of the mountain. The penguins are welcome to stay a while. Where did you find all of those penguin figures? 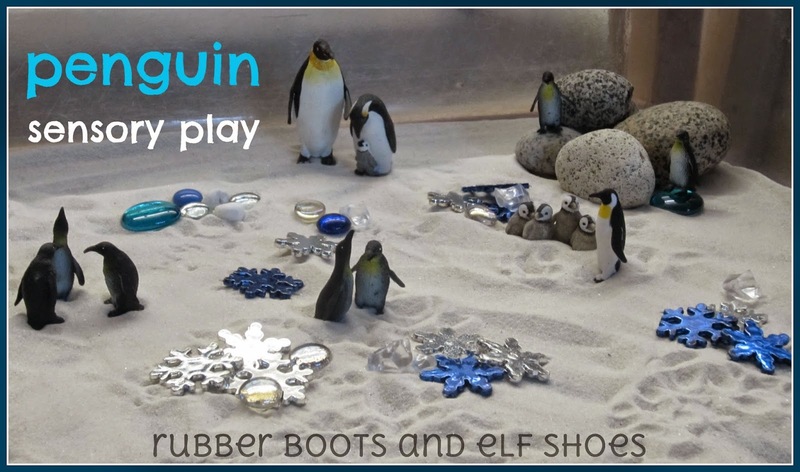 Did you purchase them recently, I have a little one with penguin intrigue! I got some of the little penguins with a colouring book last year. The other ones (the bigger ones and the group of babies) were from a quality children's toy store. 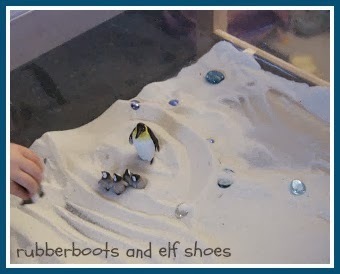 They are also available in toobs - http://www.amazon.com/Safari-683404-Ltd-Penguins-Toob/dp/B000RQ59VM. Penguins are so much fun! 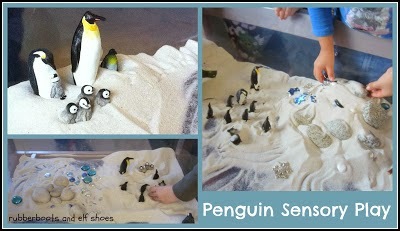 Great sensory bin! I always love the see what stories the kids create, too. Thanks so much for sharing in the Discover and Explore linky. I'm featuring this post today.